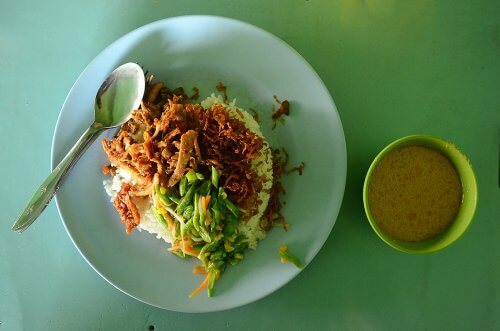 There are 5 « must-try » dishes that you should give them a try at least once during your trip to in Indonesia. I’m sure that all pack packers will afford these popular street foods because they are offered at reasonable prices. 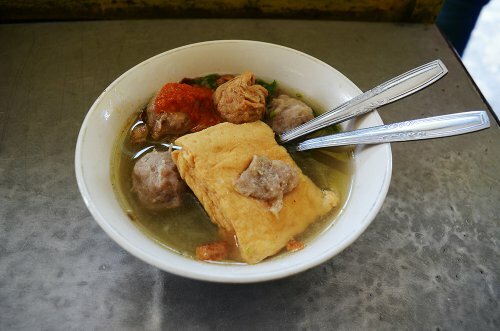 The other tasteful dishes that deserve your « try » during your cuisine tour in Indonesia is the meat soup called Soto. Made from vegetable broth and chicken, it is accompanied by rice and pasta. However, there are some places that use beef, pork, or even lamb to process this dish. Further, each places has its own recipes, display and ingredients to define its own characteristics of making this dish. To enjoy its best taste, you should eat it when it’s still warm. A bowl of meat soup is priced at a very affordable price, 8,000 rupiah (1less than 1$). Nasi goreng or fried rice is a popular dish that tourists should give a try when visiting Indonesia. As the name would suggest, this dish is made of rice and fried with different spices and ingredients based on the recipes of each restaurant. In addition to traditional fried rice, tourists now have the opportunity to taste various dishes such as nasi goreng ayam, nasi goreng ikan asin, nasi goreng kambing, nasi goreng pete, nasi goreng jawa, etc. 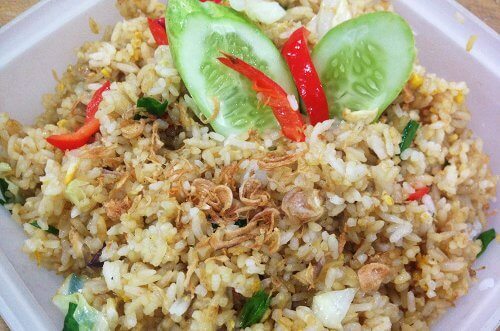 A plate of fried rice is about 10,000 rupiah (less than 1$). 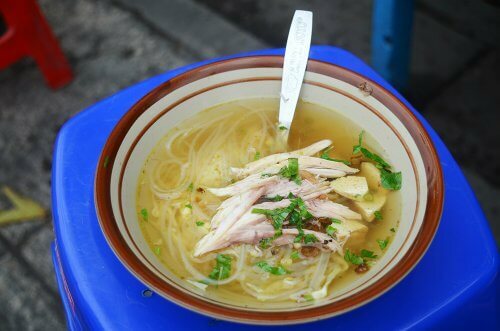 Originated in China, Chicken noodle has long been a popular dish in South – East Asia countries. 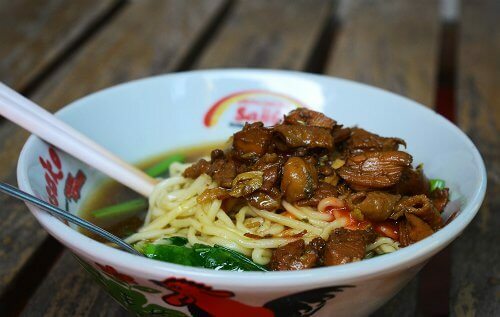 In Indonesia, chicken noodles so-called Mie Ayam is are considered as the famous dish of Chinese Indonesian people. Being processed from simple ingredients such as noodles, chicken, vegetables, green onion and various spices, the dish can be served as the main meals or snacks. After being cooked, the yellow noodle is mixed with soy sauce, garlic and cooking oil. They might use both animal fat oil and vegetable oil to separate the noodles. In term of chicken, it is cut into small pieces and cooked with soy sauce, garlic and other ingredients. The final dish of Mie Ayam is served with chicken, mushroom mixture, green onions, and a small bowl of soup/broth made from chicken bone. At first glance, you might not have nay special impression of this dish, but after tasting the tasteful and fragrant chicken as well as the broth, you undoubtedly have « crush » on it right away. Feel free to enjoy this amazing dish with only 6000 rupiah (less than 1$). Originated from Lombok Island, one of the famous tourist destinations in Indonesia, Nasi Balap is the speciality of the island, in particular, and Indonesia, in general. Therefore, tourists can find it in other islands such as Java, Bali, or Palu (Sulawesi island). This dish is accompanied by a bowl of rice, torn chicken, fried soybeans, and especially an indispensable sauce processed with a special recipe. This dish is priced at 15,000 rupiah per meal (more than 1$).